A few weeks after the Guns'n'Roses concert in Paris, I went with a couple of friends to Belgium to see them again. Hey, Guns'n'Roses don't play so often near to my town so I couldn't say "no"! Guns'n'Roses are always late on stage. They even play just before midnight at some shows of this tour, like Geneva or Prague. But every rule has an exception, and in Antwerpen, Guns'n'Rose's show started presicely at 9:30pm. Only half an hour late! That's a record!! The Sportpaleis is quite a big venue, which can contain up to 13500 people. It was almost sold out, but there were still some empty seats on each side. The sound was not as good as in Paris, it was much louder and less clear, but still good. The Belgian audience is very calm. I could easily get to the first rows, and even there there was no pogo, moshing, crowdsurfing or anything. There was even a lot of space between each person. But the Belgians are very attentive, and they were all singing the words of most songs, while staring at Axl Rose or DJ Ashba. 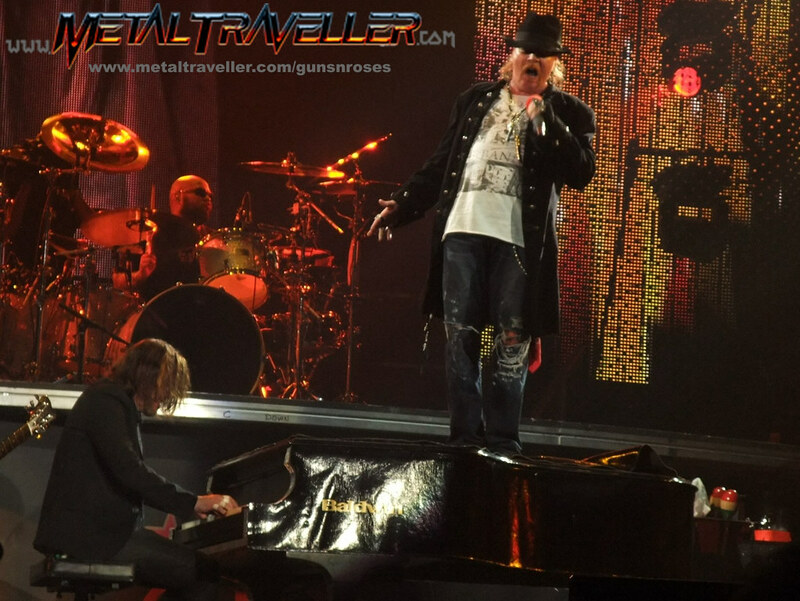 W. Axl Rose sang great tonight. Maybe because he woke up just before the show! Appart from this, he didn't talk much during the show, but he kept on dancing and moving as much as he could. He was unchained and gave a great performance. Two days earlier I saw Blind Guardian in Paris and... When you see Hansi Kürch, and two days later Axl Rose, well you know who's a frontman and who's not! All guitar players did a demonstration based on a well known-theme. Ron "Bumblefoot" Thal played a solo pased on The Pink Panther theme... with some licks from the song Estranged. Will Guns'n'Roses play it soon again? I don't know, but I know that they rehearsed it before the tour. 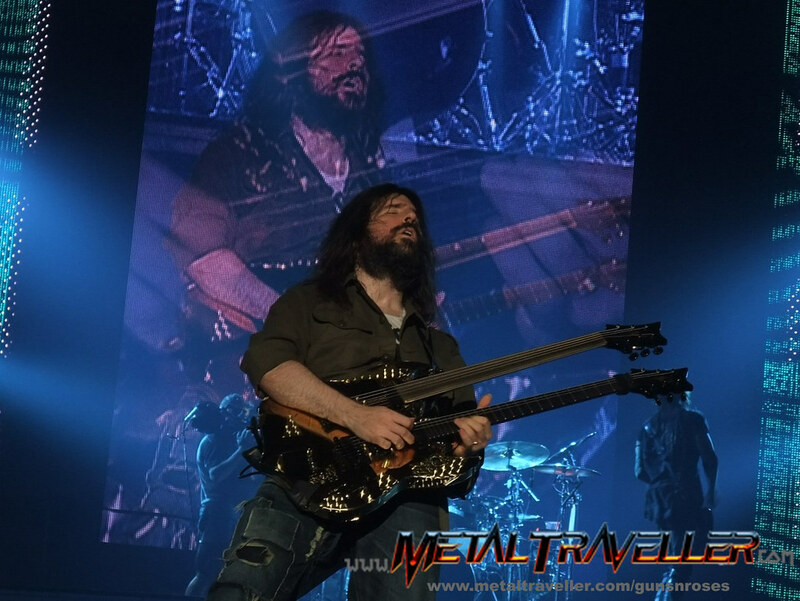 Bumblefoot uses a double necked guitar with a fretless neck. I wish he played more the fretless one, it's a very rare instrument so it really would be interesting to hear more of this on GNR's music. We had another nice surprise with Bumblefoot's solo. Usually Bumblefoot plays alone an instrumental guitar-only version of Don't Cry. This time he was joined by Axl, DJ, Richard and Frank. Surprisingly the solo was played by DJ Ashba and not by Ron Thal. It was a great surprise, so come on, bring it on next time with the whole band! DJ Ashba might be the new guy in Guns'n'Roses, but he's already part of the new image of the band. Seriously, he understood that that since Slash left, there was no Lead guitar player in Guns'N'Roses. It's been a decade since the band is playing with 3 guitarists, but none of them managed to take the "lead" vacant place. Buckethead tried, but his ridiculous image didn't fit in G'n'R. Maybe DJ Ashba oesn't have a style of his own regarding his image. He definitely imitates Slash, but at least he lookes like a full-member of the band since he joined. Guns'n'Roses setlist was more or less the same as in Paris, with few different songs. I was hoping to hear Patience, Scraped or Catcher in The Rye, which were played in some gigs recently in Central nd Eastern Europe. In places like Croatia, Serbia or the Czech Republic, thand played for almost 3 hours! They also got on stage at about 11:30pm. I guess Axl still had the time difference and didn't turn his clock back to the Western European time! Regarding the "new" Guns'n'Roses line-up, if there's one guy that definitely shouldn't be here, that's Tommy Stinson. Take alook at this picture, he would fir perfectly in Green Day, but does he really look like a Gunner? OK, music comes first. But he doesn't have the feeling needed to play in GNR! He can't make songs like Rocket Queen sound like the should, the groove is missing. I guess Guns'n'Roses will keep touring Chinese Democracy for a while, as no new album is announced. As for a reunion tour, don't even think about it (for now...). They're doing a great job as a live act and you really should go and see them. If you were disapointed by the Rock In Rio or the 2002 shows, this tour has nothing to do with those. I'll even say it's better than in 2006, when the band used to tour with ex-Skid Row Sebastian Bach and with Izzy Stradlin.